Preliminary results from two studies published online last week by the New England Journal of Medicine (NEJM) show that a single dose of the H1N1 vaccine will offer protection for most adults within three weeks of vaccination [1-2]. This is good news in the fight against H1N1, since the vaccine won’t be ready until the start of flu season. On Sunday, Health and Human Services Secretary Kathleen Sebelius said that some vaccine may be available as early as the first full week in October . Both vaccines were generated from the same vaccine virus (New York Medical College [NYMC] X-179A), and formulated and produced by either CSL Biotherapies  or Novartis . The Novartis vaccine is being tested both with and without the company’s proprietary immune-stimulating compound (called an adjuvant), MF59. The NEJM report described below is an interim analysis of subject responses to adjuvanted vaccine. The CSL vaccine does not contain an adjuvant. Adjuvanted flu vaccines have not been used previously in the U.S. and health officials hope to use a vaccine without an adjuvant because of the regulatory issues involved (more extensive human testing would be required before FDA approval). MF59 has been used extensively in Europe since 1997 with no excess reports of autoimmune conditions. The CSL Biotherapies vaccine was tested in one locality in Australia during winter at two different doses on 240 people (120 for each dose). An equal number of subjects from 18–49 years of age (59% female, 86% white, 43% had previously received seasonal influenza vaccine) and 50–64 years of age (53% female, 98% white, 48% had previously received seasonal influenza vaccine) were evaluated using a 15 microgram dose. The study also evaluated a double dose (30 micrograms) that many people assumed would be necessary in another group of 120 subjects. Although a robust immune response to the H1N1 vaccine following a single dose was unanticipated, post vaccination titers of 1:40 or more on hemagglutination-inhibition assay (a quantification of virus by hemagglutination) was observed in 96.7% of the recipients that received the 15 microgram dose and 93.3% of the recipients that received the 30 microgram dose. Titers of 1:40 or greater are considered to be protective. Thus, the low dose actually worked better than the double dose. Surprisingly, 31.7% of subjects had antibody titers before vaccination of 1:40 or more on hemagglutination-inhibition assay. For subjects who were 50 years of age or older, the researchers suggest that this could be due to the presence of preexisting antibodies from exposure to H1N1 viruses circulating prior to 1957. For younger subjects, there may be a degree of previous 2009 H1N1 infection despite stringent exclusion criteria. Additionally, cross-reactive antibodies may also have played a role. An increase in detectable specific H1N1 antibodies in blood serum (called seroconversion) occurred in 74.2% of subjects. No deaths or serious adverse events were reported. The most commonly reported local adverse events within 7 days after receiving one dose of the H1N1 vaccine were injection-site tenderness and pain. Systemic adverse events reported were headache, malaise and muscle pain. The Novartis vaccine was tested in one locality in the U.K. during summer on 100 people aged 18–50 (65% female, 82% white, 37% had previously received seasonal influenza vaccine). The vaccine is boosted with the Novartis adjuvant, MF59. Similar to what was observed in the CSL vaccine study, 15% of subjects had detectable prevaccination levels of hemagglutination-inhibition antibody. The researchers suggest that, despite excluding subjects with previous respiratory illness, this may be due to asymptomatic H1N1 infection. By day 21, post-vaccination titers exceeded 1:32 by hemagglutination-inhibition assay in 88% of subjects who had received one vaccine dose by this time and in 92–100% of subjects who had received both doses. The development of detectable specific H1N1 antibodies in blood serum occurred in 76% of subjects that received only one dose to date and 88–92% that received both doses. No deaths or serious adverse events were reported. The most commonly reported local adverse event within 7 days after receiving the first dose of the H1N1 vaccine was injection-site pain. Systemic adverse events reported were headache, muscle pain, malaise and nausea. The discrepancies observed between the two trials may be due to several factors: technical differences in measurement of antigen in the doses used, the limited number of samples evaluated and the early time point following immunization. Additional companies — Sanofi Pasteur, GlaxoSmithKline and AstraZeneca — should be announcing preliminary trial results shortly. 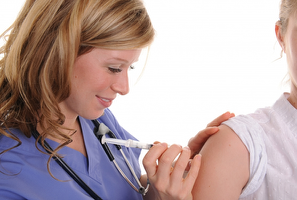 H1N1 vaccine studies in children started after the adult studies and aren’t completed yet. Researchers anticipate those results in two weeks. Exclusive: Sebelius Says H1N1 Vaccine To Be Released Earlier Than Expected. ABC News, George’s Bottom Line. 2009 Sep 13.